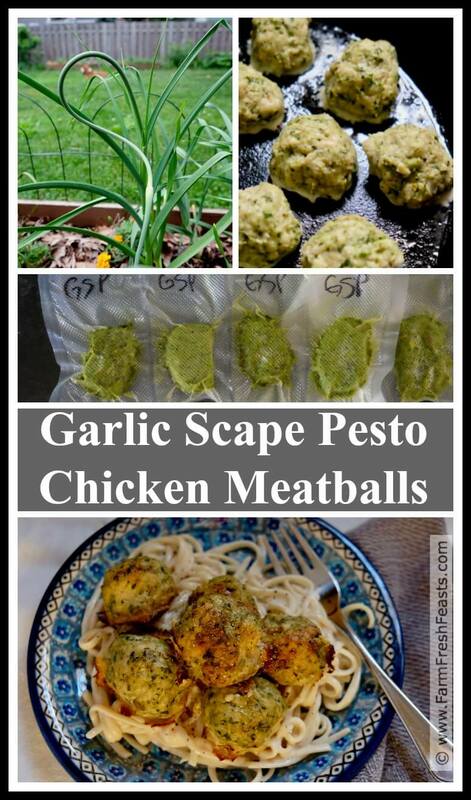 Ground chicken and garlic scape pesto makes a flavorful meatball. 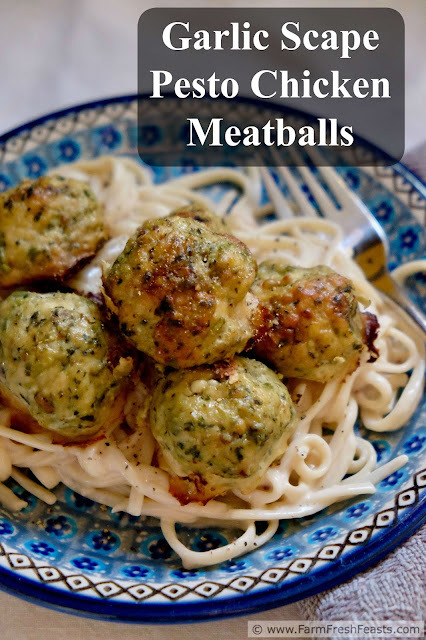 Serve this tasty Spring treat over pasta, in a meatball sub, as an appetizer or on a pizza! 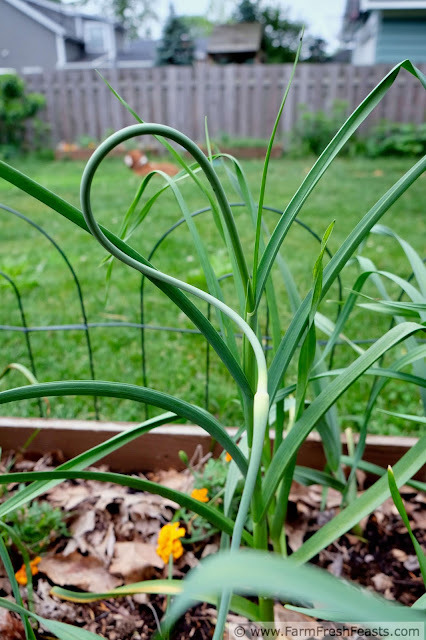 Garlic scapes are one of the weirder items in the Community Supported Agriculture (CSA) farm share box. They are a strange green hook that packs a mild garlic flavor into a curlicue shape, shown below. I think they're one of the best savory ways to kick off a new growing season and I hope to share the love with you. When I get garlic scapes in the farm share they are usually accompanied by loads of greens. Spinach, salad mix, cooking greens . . . all of these are more fragile than the hardy garlic scape. 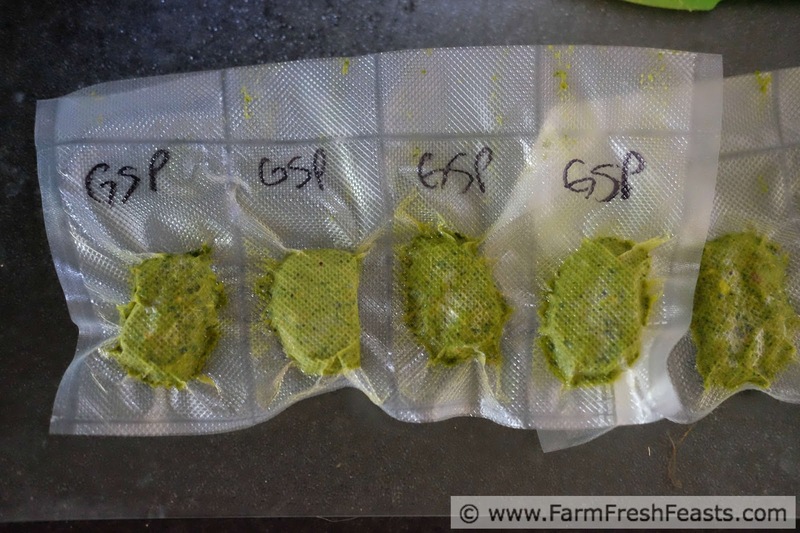 While I need to perform Vegetable Triage to ensure none of the delicate greens go to waste, I can toss a bag of garlic scapes into the crisper and remember it in a week without any problems. Once I've gathered all of the season's scapes, I make a massive batch of Garlic Scape Pesto. You can find my Garlic Scape & Pistachio Pesto recipe here. I freeze this pesto in small amounts to use throughout the year, whenever I want to add a flavor boost to pizza, or muffins, or even meatballs. Batch cooking like this (be it pesto, or meatballs, or grilled vegetables) is a terrific way to get a handle on fixing a nightly dinner. Spreading out the workload over time means you're able to eat home-cooked meal more often than not. This leads me to a small rant about cooking at home. Why is it that hiring someone to prepare your food (either by eating out at a restaurant or buying prepared food at the grocery store or big box store) is perfectly OK, but hiring someone to clean your home is considered a luxury? I wish I could get over the feeling that I'm failing by not maintaining a clean home, and replace it with the feeling that I'm succeeding by cooking most meals from scratch. Ok, rant over, time for a recipe. For more recipes using garlic scapes, please check out my Garlic Scape Recipe Round Up and my Garlic and Garlic Scapes Recipe Collection. This collection is part of the Visual Recipe Index by Ingredient, a resource for folks like me eating from the farm share, the farmer's market, the garden, the neighbor's garden, and great deals on ugly produce at the grocery store. In a large bowl, combine first 5 ingredients gently until thoroughly mixed. I use my hands. Shape into balls. 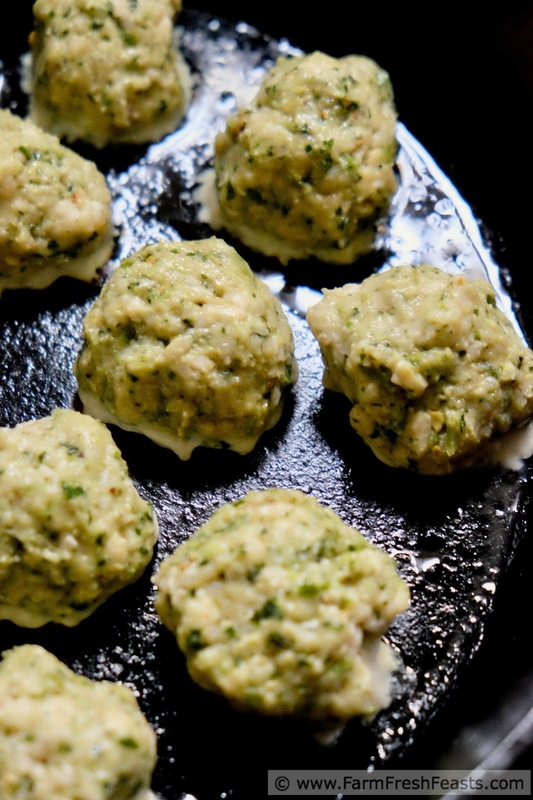 I use my moistened hands for this step, and make about 16 meatballs/batch. Chill the meatballs for 15 to 20 minutes. Preheat a large (12 inch) skillet over medium heat. Add oil. 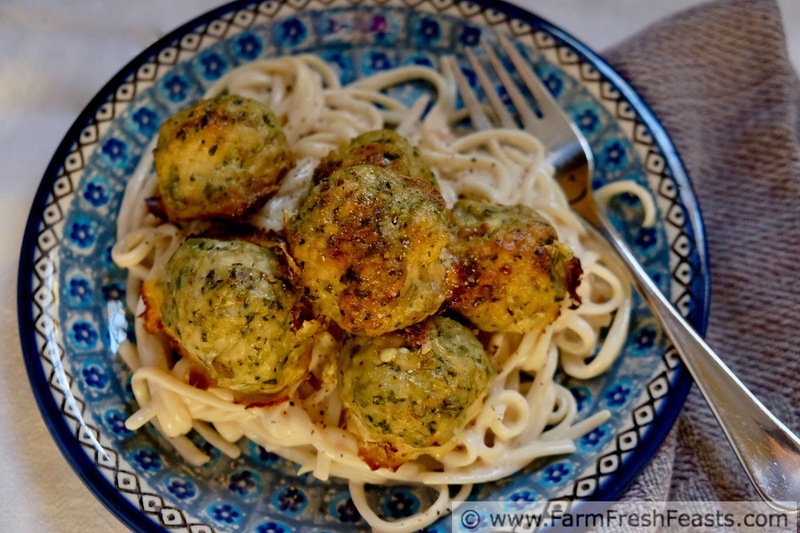 Place meatballs in skillet and cook for 8-10 minutes until bottoms are browned. Transfer skillet to hot oven and continue cooking for 20 minutes until cooked through. Serve over noodles, or on a pizza, or in a sandwich. Shown are meatballs served over spaghetti with a creamy alfredo sauce, but you do you. Hire somebody to clean so you have more time for pesto. It'll be a wonderful thing. We got our fist share yesterday and the amount of scapes we received is a holy shitton. I'm excited.